Bluebells School International, established in 1957, is a school with an international outlook which epitomizes Rabindranath Tagore's vision of humanity as one family. The tender yet sturdy flower unfolded its first petal at 129, Jorbagh, New Delhi with 5 students on roll. Watchfully nurtured by Mrs. Mari Guha, a Hungarian lady, the school soon established its premier status as an outstanding institution for early childhood education. Within a decade, another branch was established at Lajpat Nagar, New Delhi. Mrs. G. Soni, the Founder Principal and now Director of Bluebells School International took over the reins when Mrs. Mari Guha moved to London to teach Child Development at theGoldmeiths College, University of London. 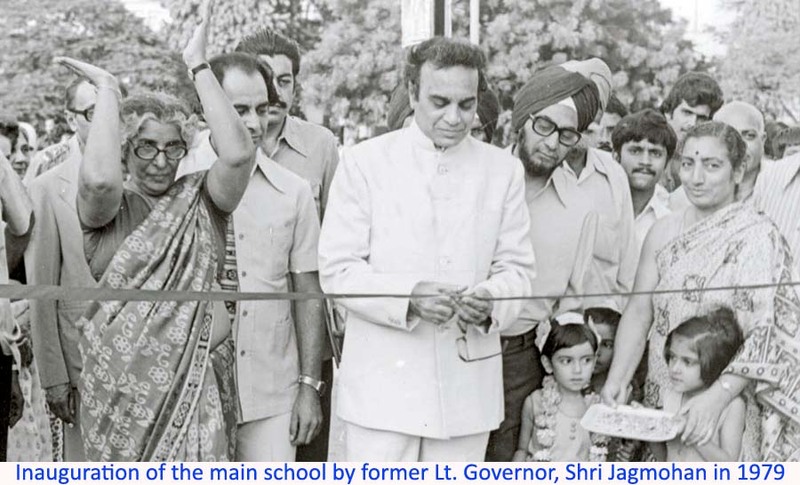 In 1977, under he Mrs Soni’s tutelage the foundation stone of the main school was laid at the present premises in Kailash. The school is housed in a 3-acre campus. The 4-storey structure has separate wings for different sections and departments. Under Mrs Soni’s charismatic leadership, the institution acquired its full fledged Senior Secondary School status in 1978 and is affiliated to the Central Board of Secondary Education. The institution is scaling new heights under the dynamic leadership of Mrs. Suman Kumar, the school’s Principal. Mrs Kumar is well known for her deep interest in the latest Pedagogic methodology of Child Centric Education. She believes in the use of cybernetic technology to make teaching - learning a vibrant and creative process of discovery. The school has a well-qualified faculty of 150 teachers who are constantly exposed to workshops, symposia and in service training to keep them abreast with the latest information. The philosophy of the school ‘One Planet the Earth, One Family - Mankind' reflects the school's ethos of international peace, goodwill and brotherhood of man. It believes in the value of global friendship with the underlying philosophy that children are the best ambassadors of harmony and peace. The school aims at holistic development with a firm commitment to “Every Child being a Winner” It strives for excellence in all avenues and exposes the students to the latest pedagogic and technological innovations. While the school emphasizes global thinking, it also believes in preserving our own culture and ideology. The traditional Indian values of humility, modesty, and reverence form the bedrock of all our interactions. The institute opens its windows wide to the culture of the world, as stressed by the father of the nation, Mr MK Gandhi, but our sterling values remain deeply rooted in Indian ethos and culture. The school strives to create a learning atmosphere “where mind is without fear and the head is held high”. Bluebells International will be a learning institution that promotes innovation, academic excellence and intellectual curiosity. It will strive to create an environment where children will realize their potential. They will grow up to be emotionally stable, tolerant and adaptable individuals with sound value systems. Bluebellians will be happy learners who will respect their own culture and will possess sensitivity, knowledge and skills to contribute to the growth of a diverse yet interdependent planet. Bluebells aspires to nurture global goodwill ambassadors. Bluebells School International is envisioned as a progressive learning institution where happy learners pursue knowledge and excellence, realise their full potential through joyful nurture of respect for self, others and the environment, by promoting inclusivity and global harmony in the belief – One Planet the Earth, One Family Mankind. At Bluebells, we prepare an educated citizenry whose humane values and core competencies form the basis of an ethical, creative and evolving society that contributes proactively to bring peace and progress in every sphere of life, in different parts of the world.